Getting a great vocal sound doesn't need to be hard. Whether you're recording or you're mixing, Nectar Elements makes vocal treatment a snap. Get great results quickly by loading one of Nectar's professionally-designed Style presets in genres like rock, pop, folk, soul, and voiceover and dialogue. From there, easily customize your sound by adjusting special per-Style controls like Presence, Drive, and Grit. Need to fix pitch problems, remove pesky "ess" sounds, or reduce room noise in your recording? Nectar Elements has you covered there, too. With 10 powerful vocal processors working hard behind the scenes, Nectar Elements offers simple, intelligent controls that let you focus on your sound, not your setup. Define your Style. Make it your own. 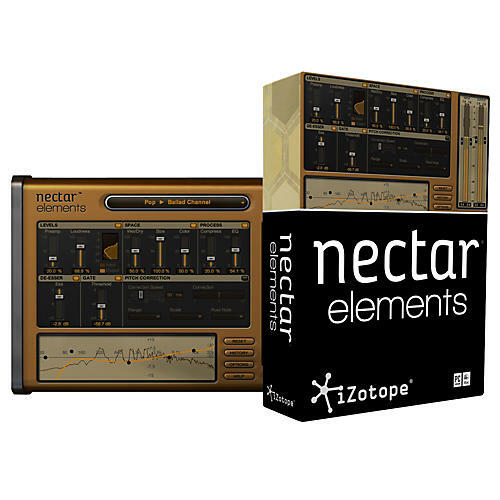 Nectar Elements features dozens of Styles that let you choose between a variety of classic and creative vocal styles. Quickly get the '60s Motown sound, the early '90s grunge rock sound, a radio-ready podcasting sound, a subtle jazz vocal or a modern pop sound”everything from delicate improvements to highly-produced robotic pitch effects. Each Style includes special per-Style controls like Clarity, Warmth, and Sparkle, as well as standard controls like Levels and Space. Liven up your vocal sound, from gentle warmth to aggressive grit, with Styles that add vintage tube and tape harmonics. Thicken up your voice with Styles that feature doubling effects, adding up to four voices with varied pitch and panning. Explore all the Styles to experiment with additional per-Style controls, each designed to perfectly complement the Genre and Style of choice. Nobody's perfect. Let Nectar Elements fix it. Even the biggest superstars might need a little help here and there. Bring out the best in any vocal performance with the corrective tools in Nectar Elements. EQ: Enhance and sculpt the tone of your voice, or adapt any Style to suit your sound's needs. Two simple steps. One perfect vocal. Pick your Genre and Style: Nectar Elements comes with dozens of built-in Styles that set up the plug-in's Main View and the underlying vocal effects. Experience the power of 10 vocal processors with just one click. Adjust in the Main View: Each Style has unique producer-level controls that let you quickly adjust settings like Presence, Drive and Grit. Experiment to personalize your sound, then tackle the Levels and Space. If needed, clean up the vocal with the De-Esser, Breath Control, Gate and Pitch Correction. Everything you need, in one convenient place. Compatible with both 32-bit and 64-bit hosts, like GarageBand, REAPER, SONAR, Digital Performer, ACID, Vegas, Sound Forge, Ableton Live, Pro Tools 7.4 to 10, Cubase, Nuendo, WaveLab, Logic, Audition, and many more.